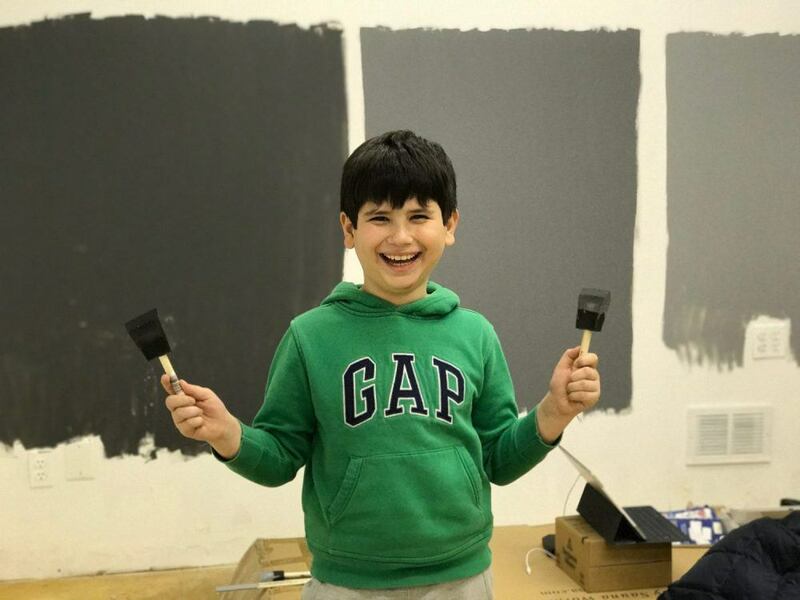 ISA AYDIN / Photography Studio / Photographic Studio – What color to paint the walls? The great news is that our photographic studio in New Jersey is opening soon. It’s already been a month since the renovation started. It was hard to find premises for photo studio that was exactly right, but we got there in the end. As you know a photographic studio not only needs to be in the right location, but has other specific requirements as well. You can read the requirements of a photographic studio in this article. We have at last found our best fit premises for perfect photographic studio in New Jersey, a beautiful penthouse situated at 15 Warren Plaza, Suite PHE-1, Hackensack NJ 07601. After lengthy and precise planning of the photo studio and office space, it was time to choose the color of the rooms. As this could only be white or a shade of grey, we decided to use Benjamin Moore paints from the local store in New Jersey. We picked three colors from the range – 1616, 1615 and 1614 – all shades of grey. Although they looked all right, we weren’t sure since the sample cards were very small. We actually needed to try them out on the walls to make sure. My son Aiden and I headed for the studio after school. We selected part of the wall which was lit by natural light from the window and could be illuminated by office lights. This was to help us make the right decision as the color grey varies in shade in different sources of light. We had to wait about 30 minutes for the paint to dry and become smooth and even. Always curious, Aiden managed to discover a closet full of toys left by the previous occupants. We found our favorite game, “Monopoly”, which helped us kill another hour while the paint was drying. ONCE IT WAS DRY, EVEN AND SMOOTH! We realized that 1616 was almost black, which you would soon get fed up with in a place where you plan to spend hours in creative activity. But 1615 and 1614 were just right, so we chose 1615 for the studio and 1614 for the rest of the office. So we used the one in the middle and the one on the right. There are a couple of things you need to remember. You shouldn’t use any other colors in a photographic studio since they leave undesirable colored shadows on your photos. Both grey and white work well. 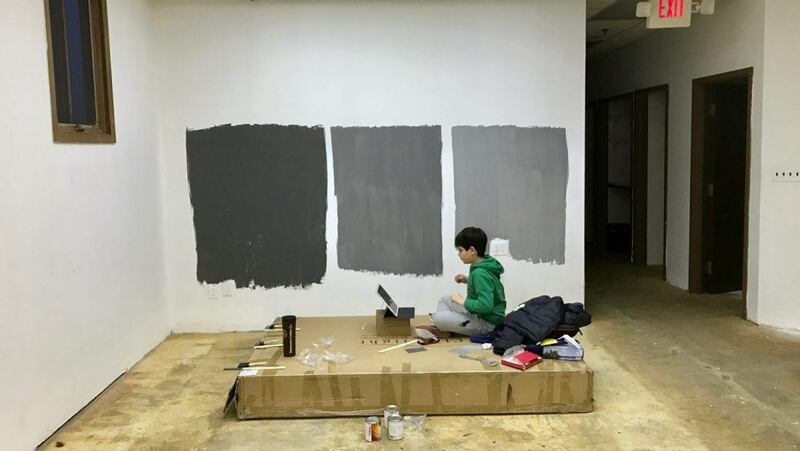 White walls act as a diffuser in the studio, while grey shades absorb most of the light. As a commercial and product photographer, I personally like to control all the lights during a shoot. So, this is why I chose grey. But many portrait photographers prefer white walls as they use the light that is reflected off them to combat the shadows. Another thing is that the walls should be painted in matte and not gloss since glossy surfaces increase bright light reflections and scatter light all over the studio. What’s more, we are going to paint our ceiling matte black, which will absorb the light as well. Our floors will be covered with dark grey vinyl. I do not advise carpet in a studio as this makes it difficult to move the stands around and carpet will easily get dirty while shooting food or splash photography. Note: Finally we decided to go with Benjamin Moore 2121-40 (Silver Half Dollar). Best color for photo studio walls as all others appeared to be very dark since we had only 2 small windows in our main studio room. But if you have wider windows and more natual light coming in, you are good to go with 1614. Our photography studio is open already for 4 months and I can’t explain how happy I am with my color selection. First off, color is perfect for photography studio because it leaves slightly cold cast on the images. The color that we chose contains a small amount of blue tint which helps the images to be slightly colder. It’s my personal preference as I don’t like warm tones at all. Second and the most important is that it reduces unnecessary reflection approx. by 30-40%. It helps to keep the lights under complete control. Comment below and I would love to answer your questions. And don’t forget to check out my portfolio! Article Title: What color to paint the walls? 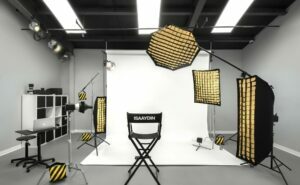 Short Description: Advertising Photographer explains what color to paint photography studio walls to have better results. Looks Amazing! Could you tell me what types of lights are in the boxes? My Son’s name is also Aiden! Which lights do you mean? The strobes that we use? Or LED ambient lighting of studio? What LED lights did you use? I am redoing my studio and struggling with kelvin temperature. Your studio looks GREAT! Great Job, looks awesome. Nice and clean. What kind of backdrop are you using? ie vinyl, paper. It looks really rugged. It’s very easy to install and can be easily cut when you need fresh paper. For ambient lighting we have 5600k LED lights. For videos shooting I use hot lights 3200k. For photography I use strobes 5600k. Sir, you have the best studio in this area. Wish I could learn something from you. What made you change from 1615 to half silver dollar? Could you tell me who is the manufacturer of the led ambient lighting (5600k LED lights) on the ceiling?